Raise your hand if you love cinnamon rolls! Just as I thought - everyone. Raise your hand if you love pizza! Yup, I see all of you. Well then you are going to love this recipe. Tomorrow morning you could be treating yourself to these warm, cherry rolls and have a scrumptious pizza that night. My friends at Abrams Books sent me an early copy of "Pizza Camp" by Joe Beddia. So many delicious pizza recipes - you will go nuts. The dough recipe at the beginning produce two loaves - I thought that was perfectly planned to make both a sweet and savory dish. 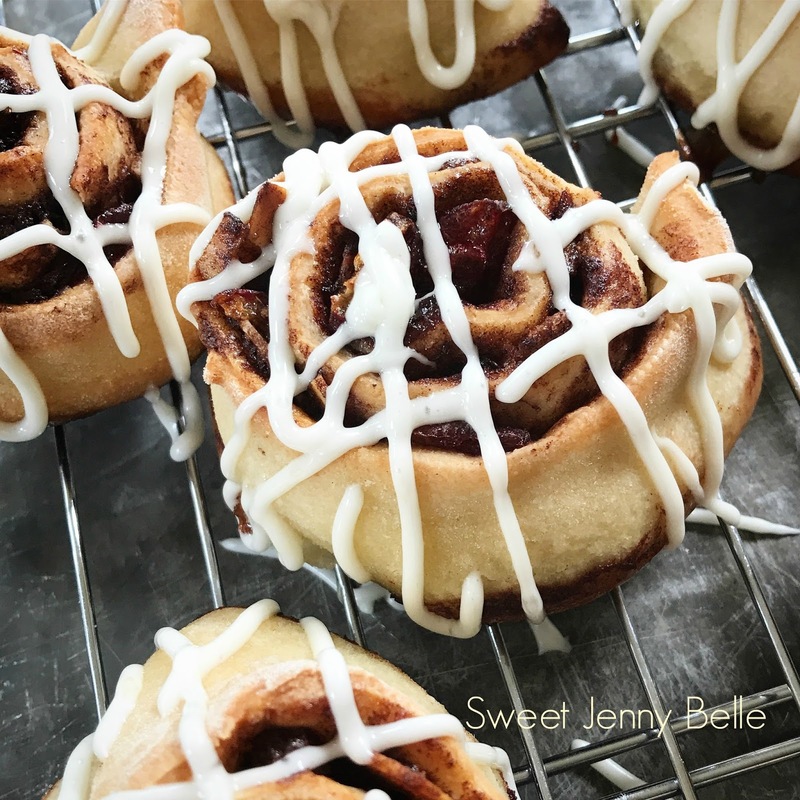 These cinnamon rolls have the soft doughy centers and delicious crispy sides. I covered them in a sweet cream cheese frosting that is sure to be a crowd pleaser. 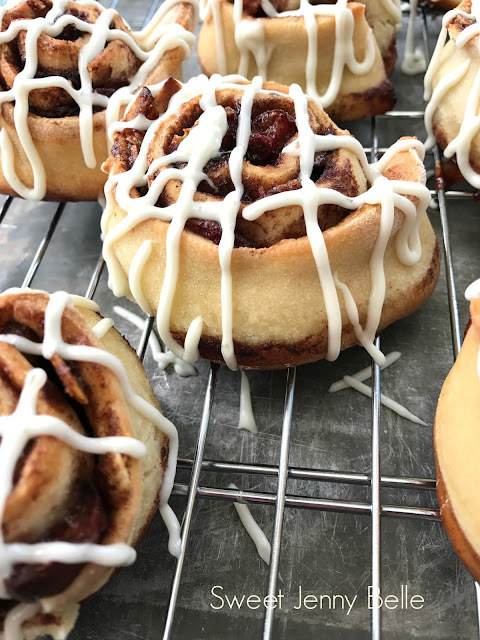 These sweet cherry and almond cinnamon rolls will be your next favorite brunch baked treat. These are quickly made with either store bought or home-made pizza dough. Preheat oven to 375F and prepare an 8"x11" pan with butter spray. Roll out the pizza dough on a floured surface until it's about 12x15 large. Using a pastry brush, spread the melted butter all over the dough. In a small bowl combine cherries, almonds, both sugars, cinnamon and vanilla extract. Sprinkle the mixture all over the buttered pizza dough. Starting with the long end of your dough, roll into a tight log form. Cut each roll about 2" thick and place into the prepared pan. Leave room for some expansion of the roll during the baking process. Bake for abut 20 minutes or until they are golden brown. While your cinnamon buns are baking, it's time to prepare your cream cheese frosting. In a small bowl whip cream cheese, butter, sugar and cream together until it's a nice smooth consistency. You have some room here to add more cream if you would like it runnier or more sugar if you like a thicker frosting. 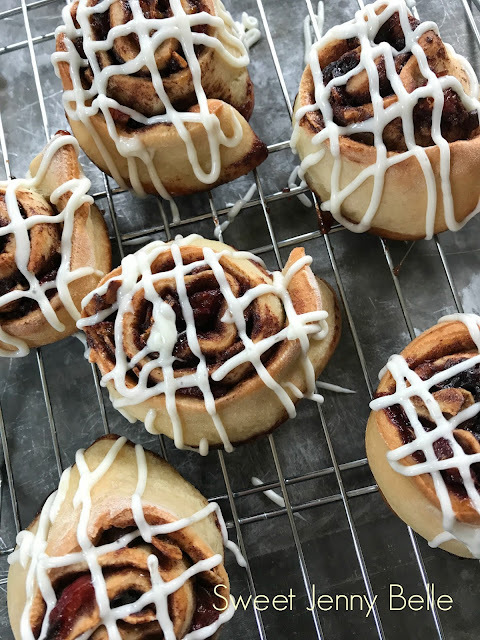 Glaze the cinnamon buns while they are still warm so that it helps melt the frosting for a delicious bite. Serve immediately and refrigerate any leftovers. These rolls are so delicious with the fresh cherries and toasted almonds. A perfect breakfast treat to go alongside your hot mug of coffee. I think these would be delicious with peaches and walnuts too.. Hmm.. Maybe another recipe soon!